Starting life as a series of comic strips created by John Ryan, the Captain of the Black Pig first set sail on the BBC back in 1957. Using a simplistic cardboard cut-out form of puppetry animation, the first series was (remarkably enough) broadcast live. The series is mainly associated with its later colour incarnation (first broadcast in 1974-75) but also returned (fully animated) in the late 1990's, An urban legend long surrounded the show, suggesting that it featured characters cheekily named Master Bates, Seaman Staines and Roger the Cabinboy. This isn't the case however, and Ryan even successfully sued two newspapers for libel over the unfounded rumour. 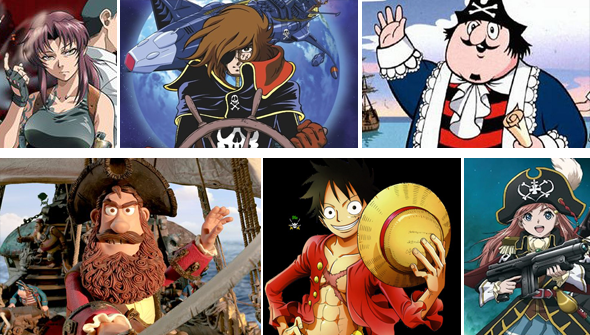 This anime juggernaut takes place in a world that revolves around pirates, so we had plenty of characters in this franchise to choose from. It wouldn't feel right not to settle on Luffy though- he is the main character after all. Inspired by his hero Red-Haired Shanks, he has set his sights on becoming King Of The Pirates. As the captain of the Straw Hat Pirates, he sets off to find the fabled One Piece to make this dream come true. Along the way, Luffy has acquired rubber-man powers by eating a cursed Devil Fruit. The only catch is.. those who eat the Devil Fruit can never swim again. Bushy of beard and soft of heart, the pirate captain, Pirate Captain is hardly the fiercest thing to ever sail the seas. In Aardman's fantastic fifth feature, the Captain is more interested in winning Pirate of The Year award than actually doing much in the way of piracy, an obsession that puts him on a collision course with Charles Darwin, Queen Victoria and one very smart chimp called Mr Bobo. For reasons that were never entirely clear, the decision was made to release the film in the US with the slightly blander title Pirates! A Band of Misfits. The crew of the Black Lagoon are a band of modern Pirates/mercenaries based in Southeast Asia, that salary-man hero Rokoru reluctantly ends up joining. The stand-out character in the series though, is easily Revy "Two Hands", the ship's tattooed, hot-pant wearing force-of-nature. An ace markswoman untroubled by conscience or morals, she fights with a pair of guns (hence "two hands") engraved with the Jolly Roger. Probably the toughest cookie on this whole list. Ron Clements and John Musker's often-overlooked 2002 flick relocated Treasure Island to a sci-fi setting, and the infamous Long John Silver is re-imagined as a cyborg. Rather than a parrot, this Silver is accompanied by a pet alien called Morph (no relation to Aardman's character of the same name). Although driven by greed and a lust for power, he is ultimately redeemed through his relationship with protagonist Jim Hawkins. James Hook is perhaps, along with Long John Silver the most iconic pirate in popular culture. And surely there is no more iconic version of Hook than in the Disney version (sit down Dustin Hoffman). One of the classic Disney Villains of all time, and unlike many baddies he was even allowed to live to see another day at the end of the film. Hook was originally voiced by Hans Conreid- who in a nod to the original stage play version, also voiced Wendy's father Mr Darling. In the world of Bodacious Space Pirates, 'space pirate' is a perfectly acceptable career choice, and pirates are even licensed by the government. Highschooler Marika becomes the unlikely captain of the ship Bentenmaru when she inherits it from her late father- who just happened to be a pirate captain. One of the few on this list who actually carries out actual piracy- but her pirate raids are incredibly civilised, essentially being glorified tourist attractions. Despite being space pirates, these particular Buccaneers choose to retain the dress sense of their sea-faring ancestors, adding to the sense of fun. Dola is the matriarch in a family of sky-pirates , and a stand-out character in Hayao Miyazaki's 1986 classic. She may have a fearsome reputation and a ruthless side, but it's clear that her crew adore her- and the feeling is mutual. Although initially driven by the desire to get her hands on Sheeta's crystal, she (and her family) are eventually won over by kids-on-the-run Pazu and Sheeta and agree to help them out. Chris The Ninja Pirate (Weebl and Bob). Pirates and ninjas are natural enemies (according to the internet) so presumably, Chris was the product of a forbidden, Romeo and Juliet style union. A recurring character in Mr Weebl's (aka Jonti Picking) first internet series, he was romantically involved with Donkey until she was shockingly. killed off in the 100th episode. "Shiver Me shurikens!"